Rose generously allowed me to pick and choose as I pleased, so I decided to start with one of the Caxtons�he has seven�and to make it The Recuyell of the Histories of Troye, 1473-4, the first book to be printed in the English language, one of eighteen surviving from the first printing, and one of just six in private hands; he bought it in 1998 at the Wentworth sale of early English printing by William Caxton and Wynkyn de Worde at Christie’s in London, for $1.26 million, twice the pre-sale estimate. From there, I chose his First Folio, a copy I happen to know a good deal about, having been present in 1989 at the Garden Ltd. sale in New York when it was hammered down with the Second, Third, and Fourth Folios to Richard Manney for $2.1 million, and then again at Manney’s sale at Sotheby’s in 1991, when it failed to meet its reserve, and was acquired privately by Lou Weinstein, then of Heritage Books in Los Angeles, who later sold it to Rose. Better known as the Haven O’More copy (see chapter six in A Gentle Madness, “To Have and to Have no More”), it is truly gorgeous, complete, and comparable, in my humble opinion, to the copy now in the library of Microsoft co-founder Paul Allen, which I handled on several occasions when it was owned by the late Abel Berland of Chicago, and later at Berland’s sale at Christie’s in October 2001 when Allen, bidding anonymously by phone, paid $6.16 million for the prize�which remains the record for a seventeenth-century book sold at auction. 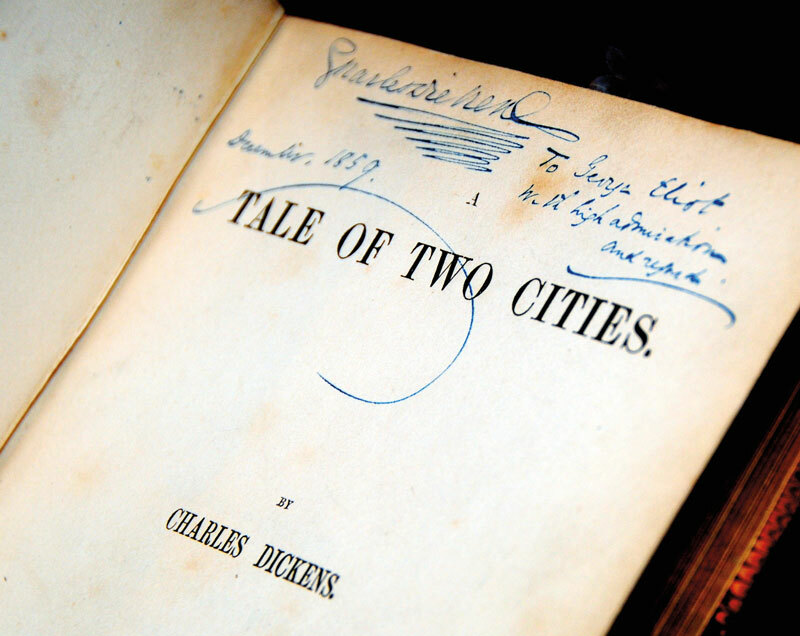 Rose’s new acquisition, a presentation copy of A Tale of Two Cities, from Charles Dickens to George Eliot. Credit: Nicholas A. Basbanes. To emphasize the point that he is not by any means standing on his laurels, Rose showed me a book he had acquired just a week earlier, a dazzling association copy of A Tale of Two Cities presented by Charles Dickens in the year of publication with this inscription, “To George Eliot. With high admiration and regard. December, 1859.” Rose said he was pleased to add the book to what he regards as “easily the finest collection of Dickens to be found anywhere in private hands,” a claim made especially persuasive by his determined purchase in 2008 at Christie’s of extraordinary association materials gathered by Kenyon Starling and the Hollywood producer William E. Self�both men, coincidentally enough, also from Dayton, and both profiled at some length in A Gentle Madness. Discussing other recent triumphs, Rose said he had “pretty much swept” the most coveted Joseph Conrad items offered at Sotheby’s in London in 2013 and 2014 that had been gathered by the late Stanley J. Seeger. According to the sale catalogue, the collection comprised “one of the greatest libraries of first editions, inscribed works and presentation copies, manuscripts, letters and annotated proofs by Joseph Conrad ever assembled, and certainly the greatest amassed by a collector in modern times.” Descriptions of everything sold at those sales, and the prices realized, are posted online at the Sotheby’s website. But truth be known, I didn’t discuss specific numbers with Rose, I didn’t have to, since everything is relative in the first instance, and because it is manifestly obvious that he is “all in,” as the expression goes, when it comes to getting what he sets his sights on, and that he has the means to do so. He is, moreover, uncompromisingly committed to building an exemplary collection that is relevant to our times, and emboldened by a desire to possess the finest possible copies. He does all of his own bidding at auction by telephone, and has a reputation among booksellers for driving a hard bargain for their choicest offerings, but that doesn’t stop them from giving him first look on items of uncommon interest.